Once you setup your Android device and link it to a Google Account, the account you used becomes the central account for your Google apps and services. But what if you want to change the account? Here are a few options for what you can do. Perform a factory hard reset on the device. You can normally do this under “Settings” > “Backup & reset” > “Factory data reset“. Doing this will wipe all data and settings from the device. After the reset and reboot, you can set up the device like new using a new Google account. Go to “Settings” > “Accounts“. Enter the credentials for the new Google account, and complete adding it to the device. Once the new account is added, go to “Settings” > “Account” > “Google“. Select the old account you wish to remove. Select the menu button at the upper-left corner, then choose “Remove account“. If you have root access to your device, you’re in luck. There is a handy trick you can use to change the main Google account without performing a hard reset. Open “Root Explorer” and select “Allow” to allow root access if prompted. Navigate to the /data/system directory. 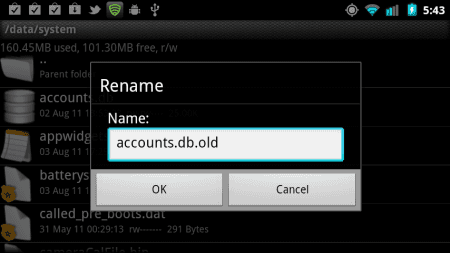 Tap and hold the “accounts.db” file, then select “Rename“. Rename the file to “accounts.db.old” to make a backup of the file. Once the device restarts, open an app that requires a Google account such as Google Play, Gmail or Hangouts. You will be prompted to create a new account or login using an existing account. That’s all there is to it.